Life Is Sweet...: Where have I been? This past Saturday I had a make & take at the store using one of the new Sizzix scoreboard dies being released this month. These dies will only cut chipboard or matboard and scores all the crease lines for you. Here is the business card holder we made. This box will hold up to 32 business cards. You can also put a giftcard in it too. 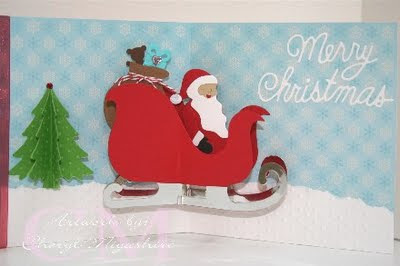 Here is the Sizzix Santa sleigh pop-up card that I finally got around to finishing. It's been sitting on my work table for weeks now. The sleigh is quite easy to put together. You can put anything in the sleigh but I decided to use the Santa sizzlit set to decorate it. The tree is an EK Success punch that I made to look 3-D and also to add some color to the card. Santa looks quite tanned but it was the only skin colored paper that I could find in my drawer of scraps. Here is the make & take that I did for Crafts In The City on Wednesday. 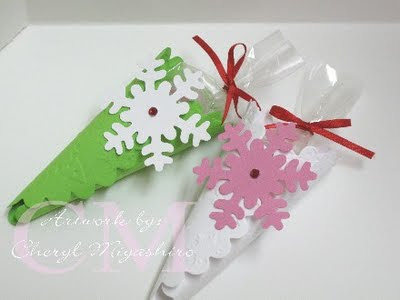 The cone was made using the Sizzix circle scallop die. We texturized the paper and die cutted snowflakes and attached some red bling and of course I had a cute package of candy to put in the cones. Now I'm working on the make & takes for the Hero preview party next weekend at the store. Hope you can come and join us. Thanks for stopping by today. I really appreciate reading all your nice comments. I hope to do some Christmas shopping this weekend. Have a great weekend!!! Labels: Where have I been? These are so cool! Love the santa, just too cute. Glad you liked your goodies! Wow! Cheryl, you have been super busy. I'm sure that Santa will be very generous to you. The three projects look fabulous. I'm going to try the texturized plate to make a snowflake. 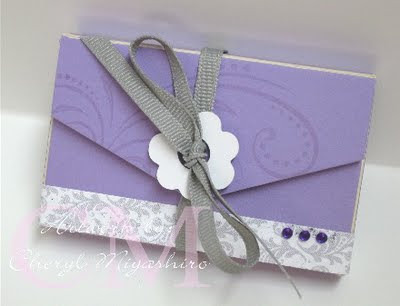 Can't wait for the new Sizzix dies that will work on chipboard. Keep being a good Christmas elf! Cheryl, these are great! Love that it can work on the chipboard too. Have a great weekend. you have been busy! love the creations you made! cute new stuff coming out! when will it ever end! haha! never! hope you are having a great week! Happy New Years to you!!! Wishing you lots of merry!